Meet Ed Kolenda – Winner of the Star Of Your Family Contest! The old saying goes, you can’t win if you don’t enter – and Ed Kolenda can surely attest to that! Ed submitted a compelling video entry for our “Star Of Your Family contest” and subsequently, won! Ed was born 28 June 1936 in Poland, the son of Piotr “Peter” Doszyń and Joanna Jara. According to family information, both Peter Doszyń and his wife died when they were living in Steinau, Germany. Upon the death of their parents, the three Doszyń children were sent to a German orphanage supervised by the American Army. In 1946, at the end of WWII, they were sent to America and adopted by the Kolenda family. Note: Ed is the middle child in the photo here. Peter Doszyń’s work papers, which stated that he was born 9 July 1908 in Ruscheltschytschi, Ukraine and resided in Steinau, Odenwald, Germany. (He came to Germany in May 1940). The christening record for Ed’s mother, Johanna Jara, showing a birth date of 6 November 1910 in Huta Drohobycka, the daughter of Joseph Jara (son of Andre Jara and Agnetta Matniej) and Rosalie Spindor (daughter of Jacob Spindor and Catharina Mocker). This record also included a note regarding her later marriage to Peter Doszyń, which took place on 29 September 1935 in Przemyśl, Poland. To see these actual documents, please visit the Kolenda page on Ancestry.com. The christening of Piotr [Peter] Doszyń, who was born 9 June 1908 in House #31, the son of Jan Doszyń (son of Andrzej Doszyń and Katarzyna Solarczyk) and Józefa Fedusiew (daughter of Paweł Fedusiew and Katarzyna Wajda). Neither his parents’ nor grandparents’ names were previously known. In addition to Piotr, Jan Doszyń and Józefa Fedusiew were the parents of at least the following children: Mikołaj Fedoszyn (born 21 December 1894) and Teodor Doszyń (born 28 May 1905). Jan Doszyń married secondly 21 May 1912 to Eudokia Polnyk and they were the parents of Józef Doszyń (born 30 September 1913) and Paulina Doszyń (born 19 August 1916). None of this information was previously known. Research in the Roman Catholic parish of Drohobyczka, Poland uncovered the christenings of two of Johanna Jara’s siblings: Paweł (born 29 June 1895) and Katarzyna (born 11 November 1898). These siblings appear in the letters provided by the family, but nothing else was known about them. Johanna Jara’s father had a previous family by another wife, and we also identified information on some of Johanna’s half siblings. Piotr Doszyń died in 1942. They had a death certificate issued for him on 11 June 1949 from the archives in Bad Arolsen. A document issued by the Red Cross on 25 January 1962 showed that Anna Doszyń (born 10 March 1910) may have died 29 July 1945 in Steinau, Dieburg, Germany. A photograph with a note, “brother Piotr, killed in Germany in 1942.” They remember their father saying that he had died in an accident—they were digging and suddenly there was a landslide and he was buried underground. The Kolenda family was in possession of several letters written in Polish, pertaining to the Jara family [their mother’s side]. These were translated and provided additional insight into their daily lives during this period of time. Locating these two new connections on the Doszyń side was a great find for Ed, and we made the decision to take him to Poland to meet them. But first, we had to meet Ed in his native habitat (Michigan) to get a better sense of the man formerly known as Tadeusz Edek Doszyń. Oh, and learn about a record we found that caught all of us off guard. 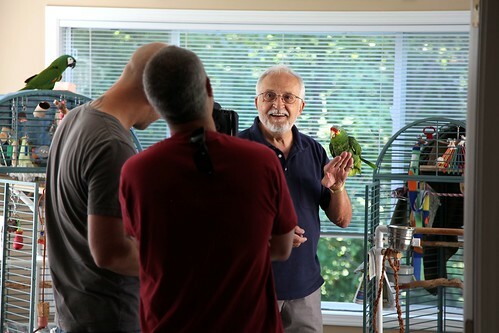 The Ancestry.com team started in Michigan, at the house of Ed and his wife Kit, where we learned more about his childhood, met his kids, dog and got up close and personal with his beloved birds. Then Ed, Kit and his sister Jean took us to a local Polish deli where we enjoyed plates full of Kielbasa, Golabki and sauerkraut. 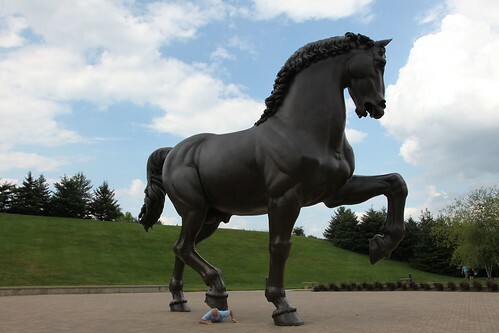 After filling our bellies with fantastic Polish dishes, we headed to the Frederik Meijer Gardens & Sculpture Park and watched Ed horse around for a little bit. While there was nothing historically tied to his story here, the Meijer gardens are a wonderful spot to take in an afternoon of art and culture. This specific sculpture, entitled “Leonardo’s Horse”, is one of two full-size casts that were made of Akamu’s 24-foot (7.3 m) design. It is quite spectacular to stand next to it, and a wonderful treat to be able to see it in person. After almost 23 hours of flying (including layovers), we arrived in Kraków and then drove 3.5 hours East to Przemyśl (near the Ukraine border). 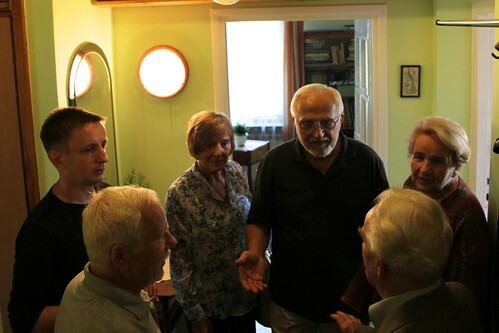 We ate, we showered, we slept a little bit – and then we headed to cousin Henryk’s house where we met him, his wife Renatte and their other cousin, Kasimierz. I don’t think there was a dry eye in the house after that door opened. 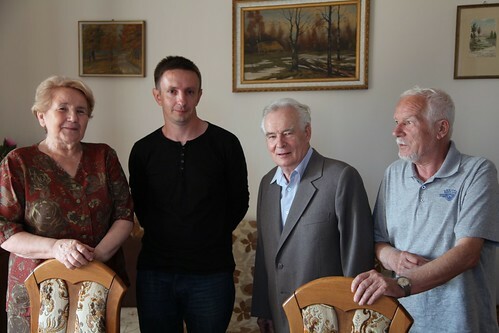 LtoR: Henryk’s wife Renatte, Zbigniew our amazing Polish ProGenealogists, cousins Henryk and Kasimierz. After hours of eating, sharing stories and photos we said our goodbyes and made plans with Henryk to join us for a trip the next day where we were visiting the Rural Architecture Museum of Sanok, which is one of the biggest open air museums in Poland. It contains 200 buildings which have been relocated from different areas of Sanok Land and gives you a sense of 19th and early 20th century life in this area of Poland (what Ed and Jean’s parents would have experienced growing up). We left Sanok and headed to Ruszelczyce, the town Ed and Jean’s father grew up in. 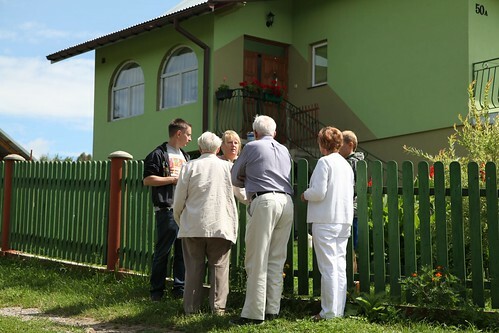 We walked to the plot of land where their house once was and met several neighbors who were kind enough to give additional information on the family and the surrounding area. We also visited the local cemetery where odds are good other Doszyń members were buried, but we were not able to find any tombstones to verify. 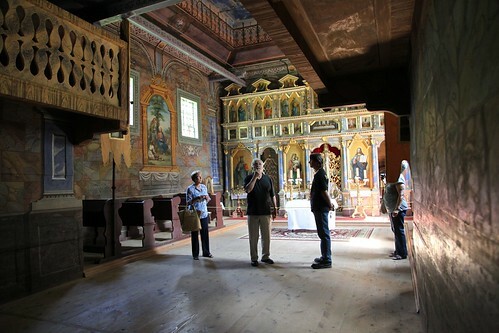 We then drove to Drohobyczka, the town their mother grew up in, and visited the local Roman Catholic Church. Interesting to note, the original church had since been torn down and rebuilt, but they kept the original altar and baptism bowl that their mother would have been christened in, which was a wonderful treat for Ed and Jean. Ed was not born on 28 June 1936 as he previously believed, Ed was actually born on 11 October 1937. This 77 year old man is actually 76! This was incredible news to everyone in the room. After discussing it with Ed, we realized he had guessed on his birthdate when filling out the paperwork needed to come into the United States and no one was around to tell him differently. But talk about a pleasant surprise! Finding this birth certificate was a wonderful way to end our trip in Poland, and it was finally time to say our goodbyes to cousin Henryk. 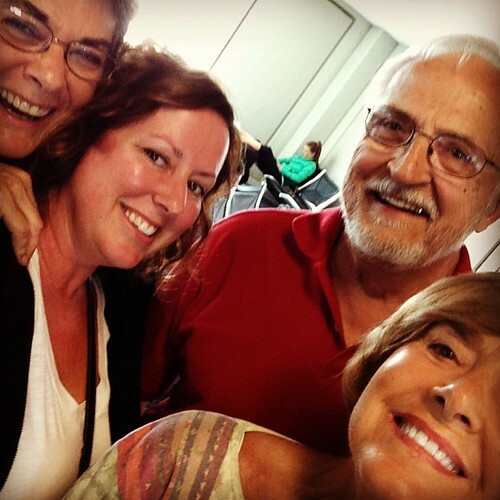 24 hours later, we were saying our goodbyes to Ed, Kit and Jean. It is safe to say we all had an incredible time on this trip and it was lovely having the chance to spend so much time with Ed, Kit and Jean. We hope this gift of family history will last them a lifetime, but as we all know, this now provides more stories for them to research on their own (right Kit?). To see more documents from this trip, please visit the Kolenda page on Ancestry.com. 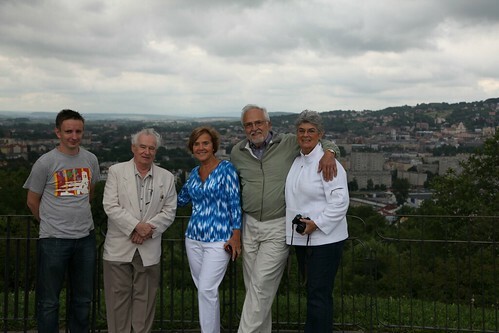 Below LtoR: Zbigniew (Polish ProGenealogists), Henryk (Ed’s cousin), Jean (Ed’s sister), Ed, and Kit (Ed’s wife) standing atop a hill overlooking Przemyśl. Want a chance to work with ProGenealogists? Enter Ancestry.com’s latest contest, “Branch Out“. The Grand Prize winner will receive 20 hours of research from one of our expert genealogists, one (1) year Ancestry.com World Explorer Plus Membership, an Ancestry.com DNA kit and an 8×8 Premium Leather Photo Book from MyCanvas.com! Complete the registration form before 11:59:59 p.m. PT on October 31, 2013. The first Grand-Prize winner will be announced on November 5, 2013 so don’t wait! We will have follow up drawings in January, March, May, July and September too! Ancestry! Great blog post! Ed, Dzień dobry! I am so so happy you have found your roots from Poland. This story has inspired me! I hope more Polish documentation will be available on Ancestry.com! Ed, I am so happy for you; what a treat being one year younger than originally thought! Sto Lat to you! Dzień dobry! What a delightful story! Dziękuję bardzo! Thank you ancestry for this touching story. Great video and photos, and what a pleasure to see the Polish lettering. I’ve always used them on my trees. 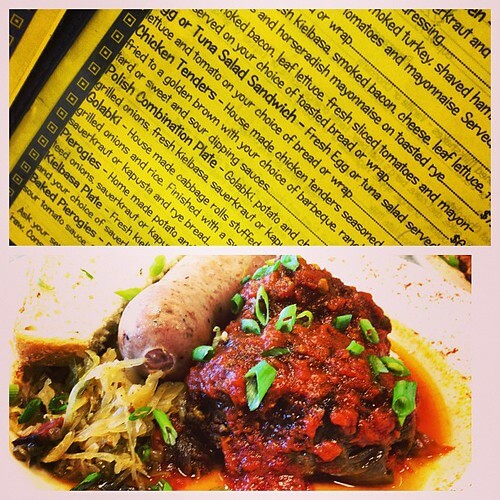 While I have never traveled to Poland, I have family and friends who have and rave about their experience. My sister met family that we never knew we had until about 10 years ago, and as in Ed’s story, she and her husband were warmly welcomed. Even with their modest means, the family treated my sister and her husband like royalty. I’m not surprised about Ed’s birth date. I’ve found the same thing many times in my research. btw, we make 900+ Gołąbki each year for our church dinner. That’s a lot of “stuffed cabbage”!! I wonder if they had any of those pierogi on the menu? mmm, good! This is a really inspiring story. Thanks for posting it! It turns out that Ed is my 2nd cousin, once removed. Our common ancestors are Andrzej Jara and Agnieszka Matwiej. After their trip to Poland, Ed and Kit contacted me. Ed and I have both taken the Ancestry DNA test and, sure enough, our DNA shows a match, confirming the paper trail!